If you’ve ever wondered to yourself whether cats can eat dog food – you’re certainly not alone! I feel like this has to be a common curiosity whether or not you own a dog, or even a cat for that matter! I know the question has crossed my mind before, and I’ve never actually owned a dog in my life (at least not yet!). 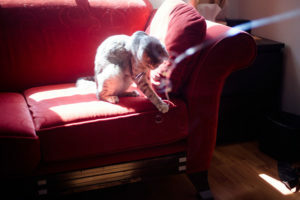 The question, however, needs to be broken down into two parts to be properly discussed, as “Can cats eat dog food?” can either be taken to mean: “Is it dangerous for cats to eat dog food daily, as their main diet?” or “Is it dangerous for cats to eat dog food every once in a while, as a snack?” Of course it can also be meant as both simultaneously as well, as a general, “How much dog food can cats eat safely (if any at all)?” – but that all comes down to how you meant the question when you first thought it up in your head! They have at least one cat and one dog, and are wondering whether it’s possible to feed both dog food – either because a cat they have prefers their dog’s food, because dog food is cheaper, or because it would make life easier to have one less type of food to buy. They have at least one cat and one dog, and a cat regularly steals dog food on top of eating its own cat food as a main meal. Those who fall into this camp most likely wonder whether it’s okay for their cat to snack on dog food, and if so, how safe it is over time, and how much dog food is too much for their cat to be eating. Either way, regardless of which angle of the question you’re here to learn about, I’ve written up an answer for you – broken down into two sections in case you wanted to learn about just one angle or the other. Part I: Can Cats Safely Eat Dog Food Daily, As Their Main Diet? Going to dive into the answer right at the start here: Cats cannot safely eat dog food exclusively, as their main diet. It may not be the answer you were hoping for, but it’s rue – cats cannot live on dog food alone. It’s unhealthy. To reiterate: Dog food is dangerous for cats to eat as their daily, main meal. 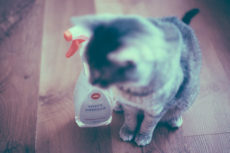 Branding men and women’s deodorants differently to make more money on women’s deodorants may be a sly trick that marketing departments play, but when it comes to cat and dog food – these are branded differently for very good reason. 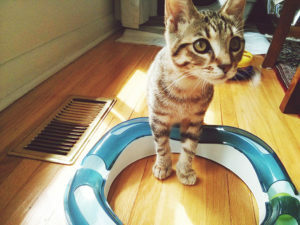 Cat food and dog food are different, they’re composed of different things, and feeding a cat dog food is dangerous because the composition of dog food is not sufficient enough to help a cat maintain good health. Over time, feeding your cat dog food is not only possibly going to make your cat sick, it’s almost certain to. 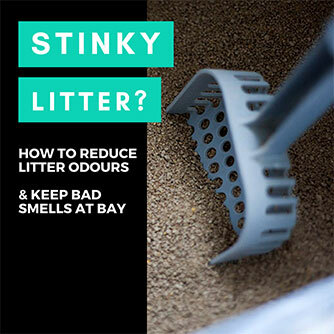 Especially if you have an indoor cat who is not at all supplementing his or her diet with any prey he or she has killed to eat from the outdoors. I’m not sure how long it would take for a cat to be sick off of eating only dog food, but it’s not something you should risk or try testing out. Again – not a marketing ploy or gimmick – cat and dog foods are different, which is why they’re labelled differently. And your cat needs to be eating cat food to stay healthy. Without these, a cat has no chance of being healthy in the long run. Dogs don’t need these nutrients in their food because their bodies produce them, but a cat’s body cannot produce these by itself, so the supplements need to already exist in their food. What can happen to a cat that doesn’t have these vitamins and minerals in his or her diet? 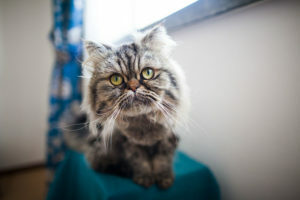 PetMD points out that even just Taurine deficiency can lead a cat to have “a devastating kind of heart disease called hypertrophic cardiomyopath.” So heart disease from just Taurine deficiency alone – obviously, this is no joke. Cats need a heck of a lot more protein in their diet than dogs do (you might not think so considering how lazy they are, but it’s true), and so it wouldn’t even be a good idea to feed cats dog food if all of the previously mentioned nutrients existed in dog food, because the protein in dog food is much too low to keep a cat healthy. The moral of the story? It’s certainly not okay to feed your cat dog food as a main meal. It is in fact very dangerous to do this. Your cat can die eating dog food alone for long enough. 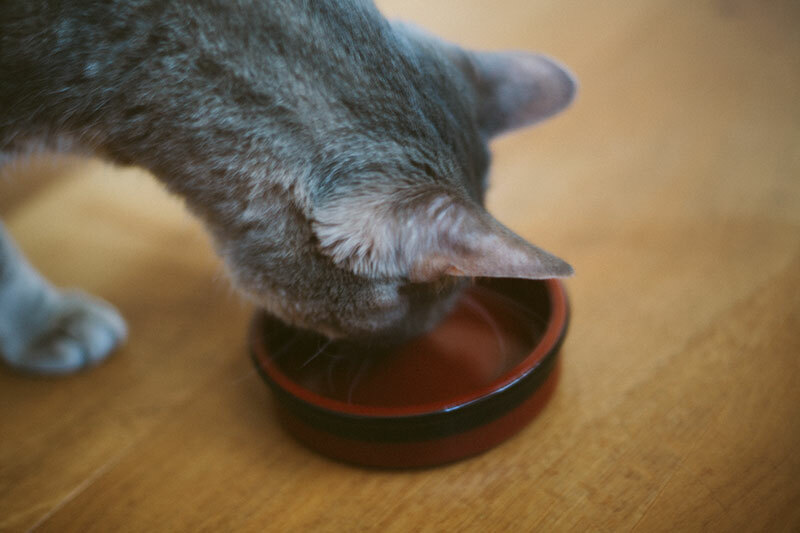 The life-threatening aspect of eating dog food as a main meal is enhanced dramatically if the cat in question is an indoor cat, though even if a cat is an outdoor cat who supplements his or her diet with what it catches and eats outdoors, it is still enormously dangerous to feed your cat dog food as a main dish, too. Why? An outdoor cat may not be hunting and eating enough prey to get the supplements it needs that don’t exist in a dog food diet. Part II: Can Cats Safely Eat Dog Food Occasionally, As a Snack? If there’s nothing in the commercial dog food your cat reacts badly to, a cat can safely eat dog food occasionally, as a snack. Is started that statement with a qualifier because some cats apparently react poorly to PG/propylene glycol, which exists in some commercial dog foods. So please be aware of this issue. 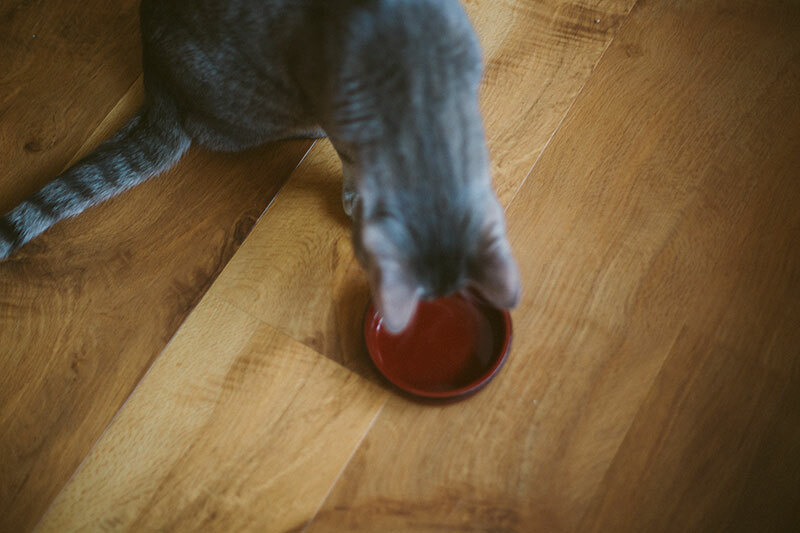 If you’ve got a cat who grazes on a bite or two out of the dog’s food dish every so often, or even every day, that should be okay. An issue only arises when the grazing comes to a point where too much dog food is ingested, just the same as an issue would arise if a cat started to eat too many unhealthy cat snacks. 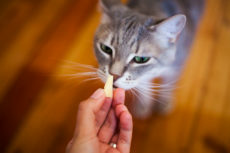 Though nobody knows exactly how much unhealthy snacking is too much, the rule of thumb floating around seems to be if your cat’s diet consists of at least 90% high quality cat food, and thus less than 10% low-quality snacks (including dog food and other cat treats), your cat’s health should be perfectly fine. But it’s agreed that too much snacking on commercial cat treats or dog foods is not a good thing for your cat’s overall well-being. 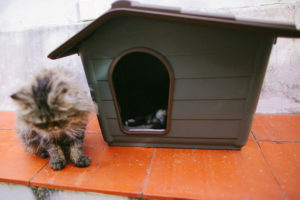 Having a lot of commercial cat treats and dog food is the equivalent of going to MacDonald’s for a cat – fine every once in a while, but considering they’re not the ideal diet from a cat, ultimately harmful if too much is eaten. Should I Feed My Cat Dog Food as a Snack? Personally, I wouldn’t feed a cat dog food as a snack, because I’d be concerned about the percentage getting to be too high, or a cat developing for a taste for the commercial dog food that makes it dislike its own cat food enough to ignore it. 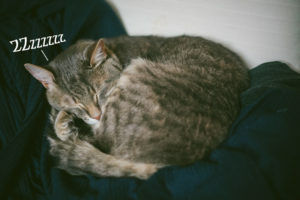 I feed my own cat kibble as a snack, sometimes using the same kibble I use for a main meal, other times using a different variety of cat food that I know to also be healthy. To prevent overfeeding, I measure out the day’s kibble for Avery each morning, and feed him only from that jar for the day. Works for me since Avery doesn’t mind at all eating the same food for a snack and for meals. Why Does My Cat Keep Trying to Eat Dog Food? 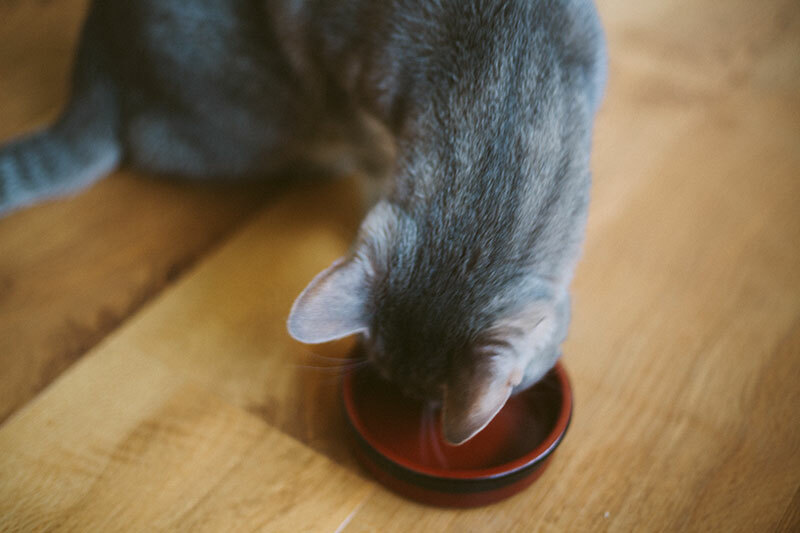 Your cat may, simply put, really like the taste of your dog’s food. We humans like foods that are unhealthy for us all the time, cats are the same in that they can have a liking or preference for foods that are less-than-ideal for their health just because of taste. 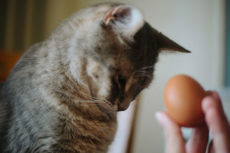 Another possibility – your cat may prefer to have some variety in his or her diet. If you feed your cat only one type of cat food and you think this is the case, try getting a small bag of a different high quality cat food to feed your cat as a snack. Verity can still be offered to cats in a very health conscientious way. I Think My Cat Snacks on the Dog’s Food Too Much – What Can I Do? 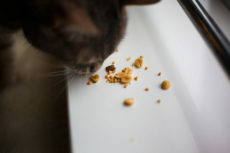 The best option if you feel your cat snacks on dog food way too much is to feed your pets in meals, not leaving food out throughout the day for them. 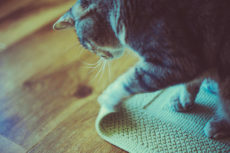 You don’t have to feed meals only once or twice a day, you can easily delve out meals 3 or 4 times a day if you think your cats would prefer it, but sticking to meals and watching your cats polish off their own dishes is, in my opinion, the best and easiest way to make sure no pet thieves steal what’s not theirs. If you have small dogs who are micro-chipped, you could also try out using a microchip automatic-feeder that will only feed a pet if it has the right microchip. These are probably the easiest hands-off method to prevent pets stealing other pets’ food. Finally, if you think your cat is only eating dog food due to craving some variety in his or her diet, trying to find a cat food your kitty likes more than the dog food that you can leave out for your cat as a snack might just do the trick in and of itself. Let me know in the comments section if you have any other tips for pet owners whose cats snack on dog food a little too much. Thoughts on Cats Eating Dog Food? That was quite a lot of information, so there’s an enormous amount to discuss! Had you ever wondered about whether cats can eat dog food before? Which angle were you thinking about when you thought up the question? Have you ever wondered whether branding cat food and dog food differently was just a marketing ploy? Did you know prior to readin this article that cats can’t eat dog food exclusively as a main meal? If you stumbled across this article because your cat steals and eats your dog’s food, what’s your situation like? How many cats do you have and do they all snack on dog food? Are you able to switch your pets to meals instead of free feeding or will that option not work for you? Would you ever try a microchip automatic feeder (if your dogs aren’t too big)? Can you think of any alternate solutions to this kind of problem? Have you tried anything before that’s worked? Looking forward to reading your thoughts in the comments! 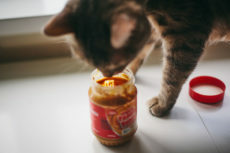 Can Cats Eat Peanut Butter? Is It Okay to Feed PB as a Snack? We have 2 dogs and one cat. Our cat seems to have stop eating his own food and only eats the dog food. We used to fill the cat food bowl daily. Or well twice a day. We have a 17 lb cat. (This is my husband who thinks food is love and loves bob more than the dogs). But I have become worried because we no longer fill the cat food bowl even daily. Telling me the cat is eating more dog than cat food. It’s been going on for probably two months now. Our cat food bowl is in the bedroom on a shelf just for bob. The dog food bowls are in the living room. We free feed the dogs. Doing “meal times” would be difficult as our dogs can vomit if they produce too much bile and don’t have food in their stomachs. I wish there was more information on how long before a cats body starts to show impairment due to lack of vitamins and what signs to look for. We are moving a second cat food bowl to the kitchen table hoping it will encourage him to eat his own food. And we are trying the same brand food as the dog eats but “for cats”. Hoping maybe the flavor being similar will encourage him to eat his own food. The simplest way I can think of to solve this problem is to switch to an microchip pet feeder for the dogs, like the SureFeed Microchip Feeder. It uses either microchips, or if your pets aren’t chipped, a SureFlap RFID collar tag, to determine whether the pet eating the food will be allowed access. Just allow access to all the dogs, but not the cat, and you should be good to go, no matter how tempting the dog food is for your cat. Good on you for suspecting there might be a problem and checking into it by the way. My cat never seems to be satisfied food wise. When I fed her a can of dog food she was satisfied for the rest of the evening. She was more satisfied, calmer and acted like a cat should act. What am I doing wrong. What can I feed her that will satisfy her so she is less destructive. She is half Siamese and half Burmese. I once tried Royal Canin’s Appetite Control formula when Avery went through a phase where he just wouldn’t feel full. Didn’t use it exclusively, just on the side of what he was eating, especially at night so I could get him to feel full enough to wait until morning – worked like a charm for him. If your cat has no dietary issues and isn’t on a special formula for health reasons, I’d recommend giving it a shot, maybe alongside her regular kibble at first to see if it helps, or fully onto it if she’s still having issues feeling full. I can’t say if it will work for her, but it definitely worked for Avery. I don’t think we would be a big fan of dog food. We used to have dogs and I didn’t try their food. That’s very good! I wonder what percentage of cats would actually try eating dog food. Maybe it’s the type of dog food that has something to do with it, too?